Where does the icon used for the Navajo course come from? Does it have any particular symbolic meaning? Good question. It isn't the flag of the Navajo nation, which is pretty complex and would probably not be easily reducible to a small icon, but it is a symbol I have often seen associated with Navajo art. It is a picture of a basket. 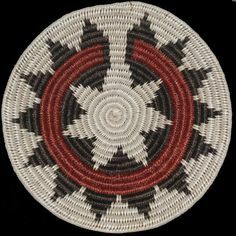 The ts'aa' also known as a "wedding basket" is used within many Diné ceremonies-- with the wedding only being one time it is used.